In the mid 1700's, rumors of a large continent at the South Pole circulated, but because explorers had not yet encountered it, Antarctica's existence was doubted by many. James Cook was an English explorer who led several early expeditions aimed at exploring the landmasses in the far South. In 1772, Cook led an expedition composed of two ships; Cook commanded the HMS Resolution, and Tobias Furneaux commanded the HMS Adventure. This expedition was the first to circumnavigate the Earth at such a high Southern latitude. They reached as far south as 71 degrees, 10 minutes latitude. However, due to extensive sea ice, the expedition was unable to reach Antarctica despite several attempts to travel farther south. Upon returning home in 1775, Cook reported that the myth of a continent at the South Pole was nothing more than just that: a myth. Inspired by Cook's southern expeditions, Russian explorer Fabian Gottlieb von Bellingshausen led voyages to further explore the southern oceans and land masses. In 1819, Bellingshausen led a two-ship expedition that was the first since Cook to pass into the Antarctic Circle. Because Bellingshausen's expedition made their southern attempts during the Antarctic summer (November to February), sea ice extent was reduced. On January 28, 1820, the expedition discovered the Antarctic mainland, and Bellingshausen became one of the first people to see the fabled continent. Unfortunately, because of sea ice, the ships were only able to get within 20 miles of Antarctica, and so this expedition could not claim the first landing on Antarctica. Nonetheless, they had finally proven that a continent does in fact exist at the South Pole. —Photo by Frank Hurley, courtesy of the Macklin Collection. The Endurance wrecked and crushed by the ice. 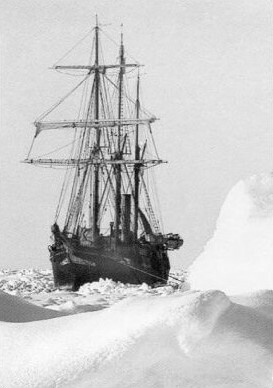 Sea ice played a key role in the British expedition of 1914 to Antarctica, led by Ernest Shackleton. 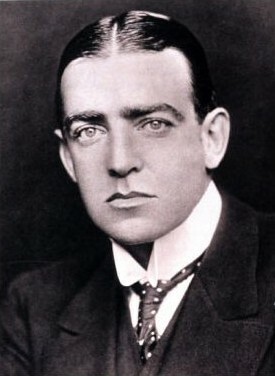 The goal of the Shackleton expedition was to cross the entire Antarctic continent from the Weddell Sea to the Ross Sea. Shackleton's ship, the Endurance, sailed into the Weddell Sea in 1914 with a crew of 28 men, several dogs, and one cat—Mrs. Chippy (who was actually a male). 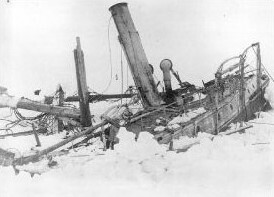 They encountered more sea ice than expected, and the Endurance became trapped in the ice on January 18, 1915. For several months, the ship drifted with the ice until it was finally crushed by the ice, like the Jeannette had been in the Arctic. The crew abandoned the ship on October 27, 1915, and began walking across the ice, pulling three lifeboats along. They kept the dogs to help pull the lifeboats, but Mrs. Chippy had to be killed after they abandoned the ship because the crew could take with them only what was absolutely necessary. The cat's amazing story is told in Mrs. Chippy's Last Expedition: The Remarkable Journal of Shackleton's Polar-Bound Cat, by Caroline Alexander. The crew found that crossing the ice was impossible, even with the help of their dogs. The ice was full of ridges (piles of ice) that they had to climb over, and the wet snow was sticky, making it even more difficult to drag the lifeboats. After a couple of attempts to cross the ice, the crew built a small camp on the ice and waited for the drift of the ice to carry them northward. They killed the dogs because their food supply was limited, and they could not spare extra for the dogs. Additionally, the dogs themselves provided extra meat for the crew, who did not know how long they would be stranded at their camp. On April 9, 1916, after 164 days of drifting on the ice, the ice floe they were camped on finally reached the ice edge and began to break up. They boarded their three small lifeboats and sailed through rough seas, with little food or water, for seven days. Eventually, they reached the small, uninhabited Elephant Island near the northern tip of the Antarctic Peninsula. For the first time in 497 days, the men stood on real ground. However, the island was small, unsheltered, and far from any sailing routes. The chance of being rescued by a passing ship was minimal. No one knew where they were, or even that they were in trouble. Shackleton decided that the only hope of saving his crew was for a small group to attempt to sail to South Georgia Island, which had a whaling station and a ship that could come back and rescue the rest of the crew on Elephant Island. South Georgia Island is 1,287 kilometers (800 miles) to the east of Elephant Island, across some of the roughest seas in the world. Shackleton hoped to do it with rudimentary navigational equipment in the James Caird; at 6.7 meters (22 feet), it was the largest of the lifeboats. After 14 days of sailing, the crew ran out of fresh water. Fortunately, on the verge of dehydration, they reached South Georgia Island two days later. After a 36-hour hike across a steep and snowy mountain range, they reached the whaling station on May 20, 1916; this was their first encounter with civilization in 531 days. Shackleton could not rest long at the whaling station. He needed to return to Elephant Island and save the rest of his crew. Even though he left immediately, it took three attempts and more than three months to rescue the crew because sea ice prevented the ships from reaching the island. Finally, on August 30, 1916, the rescue ship made it to Elephant Island. Amazingly, after 143 days on Elephant Island, 307 days since abandoning the Endurance, and almost two years after the beginning of the expedition, not a single person in the expedition perished. A little-known part of this story involves the Aurora, which sailed to the other side of the Antarctic continent to haul supplies for Shackleton's planned trek across the continent. The Aurora crew also encountered harsh conditions, and three crew members were killed when they left the ship. They unwisely ventured onto unstable sea ice. A blizzard appeared, and they were never heard from again.